Rather than disabling the Caps Lock key on your Mac, consider a better idea for many users: simply reassign the key to a new keyboard function. 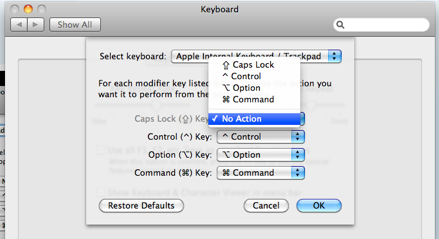 This means that if you press the Caps Lock button, instead of initiating THE SCREAMING CAPS LOCK ALL UPPERCASE function, it could trigger something like the Control button, Command button, or Option button. Sound good? I think so to. For example, I have a friend who remapped Caps Lock to function as a CONTROL key because it’s easier to press all three buttons at the same time for certain keyboard shortcuts. Of course, you’re free to pick whatever you want as the replacement, but it’s a great consideration that beats disabling the keys functionality entirely – otherwise you’re left with basically a dead key on the Apple keyboard. If you switch these around, get confused, and decide you want to go back to the keyboard defaults, just click the “Restore Defaults” button to return to normal button functionality. What do you think? Is this better than disabling the key completely? Or would you rather just lose it? What I *really* want to do is disable the Help key. Anyone? Anyone? I’ve tried making new keyboard maps and everything, but have always failed. What I normally do is swap control and caps lock. I find a control key in that position much more useful! Swapping Caps Lock and Control is very common if you came from a Sun environment. What I’d like to be able to do is use the CAPS lock as a 2nd Shift key (thus not lock). Purpose: I use my MBP to game and use the shift key a lot. While focusing on the screen action, I often hit CAPS instead of Shift with no expected results of course. Since I never need CAPS, I’d love to extend the shift key to it if at all possible.